Chrysalis Tarot opens up your psyche and illuminates your path toward personal destiny. Exquisitely drawn Otherworld characters and mythological archetypes guide you on your spiritual quest. 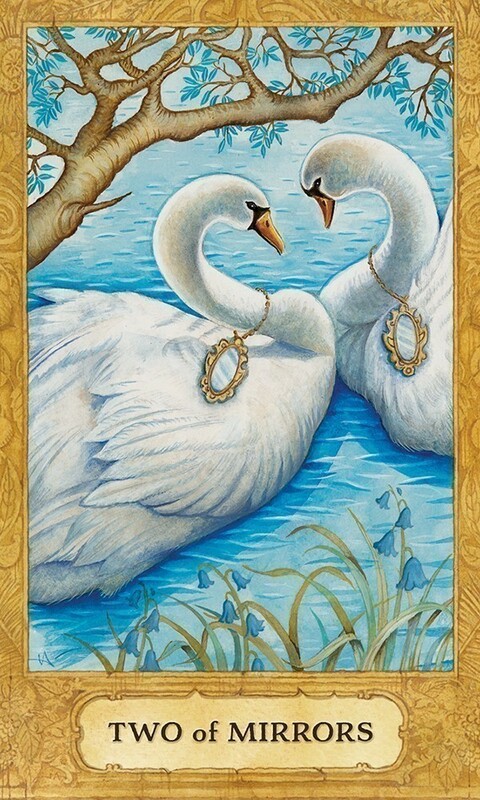 Both the Major and Minor Arcana feature beautifully illustrated scenes that inspire reflection and stimulate your psychic intuition and imagination. The four suits that make up the Minor Arcana are: Stones (Pentacles); Mirrors (Cups); Spirals (Wands); and Scrolls (Swords). In the Court Cards you’ll meet a delightful troupe of medieval messengers who inspire you to fulfill your dreams. Deck includes 78 cards and 60-page booklet with instructions for a five-card Pentagram Spread. Holly Sierra has been drawn to all things mystical and magical since her childhood. Her vibrant paintings allow us a glimpse into an enchanted world filled with goddesses and mythological creatures. Holly’s infatuation with Tarot began when she was a teen and discovered an antique deck amongst her parents’ possessions. 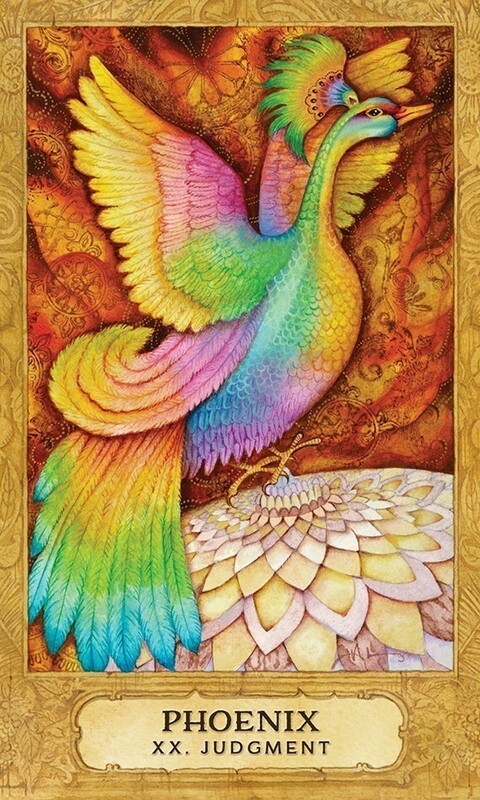 The Chrysalis Tarot deck is dedicated to both her beloved parents. After pursuing a fine arts education, Holly lived and traveled extensively in Asia. Multicultural themes influence her artwork, which has appeared in children’s books, magazines and greeting cards. Holly makes her home amidst the picturesque, green mountains of Stowe, Vermont. After retiring from broadcasting twenty years ago, Toney traveled the world researching spirituality. He studied, both formally and informally, a number of metaphysical subjects including comparative mythology, philosophy of history, and an obscure area of theology known as Mariology. He holds a PhD in Metaphysics and a certification in Spiritual Counseling. 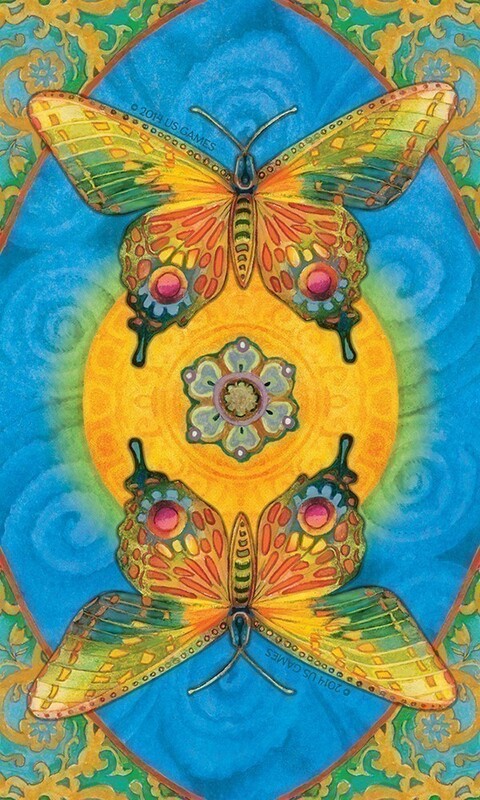 I love, love, love the Chrysalis Tarot. I feel the whole idea is so suitable to the metamorphosis of human development. The cards are attractive and easy to understand. The cards are unique and for the people I have read for - the new take on the cards allows for intuition to actively participate. Every now and again a product comes along that brings such a fresh take on somewhat stale concepts, it becomes clear early on that product is destined for lots of awards, sales and satisfied consumers. 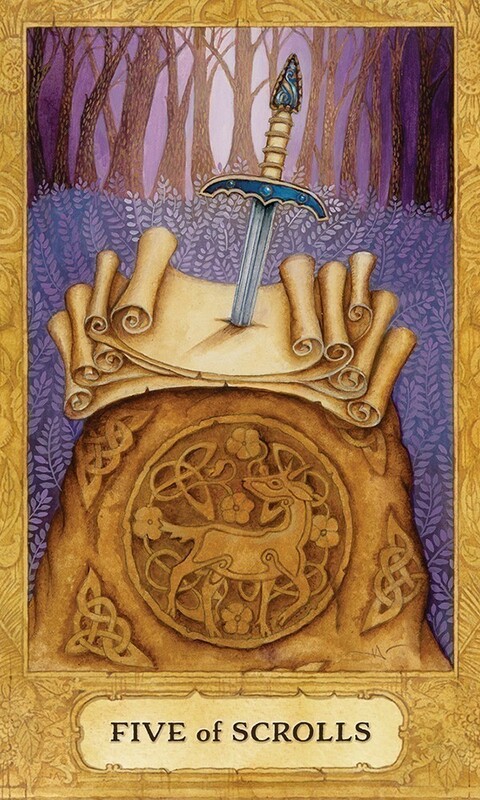 The Chrysalis Tarot is absolutely one such product. The artwork by Holly Sierra is not like anything else on the market. Her paintings are a mixture of folk, tribal, Celtic, Medieval and New Age. Yet everything about this tarot deck works in perfect harmony. It's like world peace in a box. Each of the 78 cards in this deck is mesmerizing. The colors, the creativity in the meaningful imagery and the attention paid to detail is simply a cut above. It's time to talk about the Chrysalis Tarot meanings penned by Toney Brooks. These tarot meanings are crafted in such a way to deliver deep symbolism served up in an understandable and entertaining manner. Each card denotes its Rider-Waite twin soul and somehow he has discovered a way to pack a ton of sage wisdom into words that energize as they're read. The Chrysalis Tarot is a deck all appreciators of tarot art and tarot meanings should own. For tarot readers who resonate with its imagery, this deck is sure to bring a whole new level of channeling to your readings. Kudos to Holly Sierra and Toney Brooks! Congratulations to their publisher, U.S. Games Systems, Inc. for a shrewd acquisition made. The artwork is beautiful. That much is obvious. But there is more to this deck than a pretty face. Chrysalis is full of symbolism without being busy. It bears characters from different cultures, and when you look at the characters, there is a strong sense that they each have so many lessons to teach you. The culture mix is one that works, and that is because in life there is no one "correct" way to gain wisdom. You can gain wisdom from any kind of person, even from a small child. 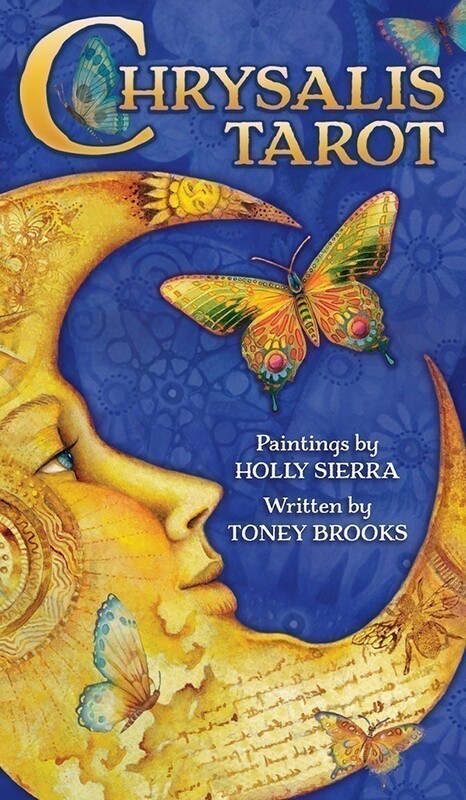 The author (Toney Brooks) and artist (Holly Sierra) understood that when creating Chrysalis tarot. There are lessons to be learned in good times and bad, in your elders, family, neighbors, and even in folk tales if you know how to find them. Chrysalis guides you to healing, empowerment, and peace with yourself and the world around you. If you have ever thought of meditating with a card, or doing pathwork, this is an excellent deck to do that with. In fact, I find some of the cards grabbing me by the hand and pulling me in so that the cards can share their story with me. It is a very chatty deck. I love that each suit has a color theme, representing each element. The change from cups, wands, swords, and pentacles to mirrors, spirals, scrolls, and stones are appropriate and drive the point home. My favorite is the change from frustrating court cards in other decks to troupe cards that are around to guide the querent on their journey. And let me not forget to say, there is no Emperor and Empress than Chrysalis' Green Man and Gaia. If you want a deck to help you on your own Hero's Journey, Chrysalis is the way to go. It is not just any deck, but one focused on healing, wisdom and enlightenment. I was, naturally, intrigued by the image on the box as shown for this item. I checked out US Games to look at a few of the other cards (Usually the tarot publishers have at least a few more cards you can see to get a feel for a deck.) I admit I love tarot cards as much for their artwork and creativity as for actual use in divination! These cards are beautiful! Even the back image is stunning! I also like that the deck is kind of Rider-Waite, yet not. However, although they use different names for the cards, they also indicate what the RW card is called (Card III of the Major Arcana is named "Gaia" but just underneath it is labeled "III. The Empress"). Images are clear and really, just beautifully illustrated. The card stock is a nice weight and the coating is neither too slippery or too clingy. They will naturally be rather stiff at first--I found it a little difficult to shuffle them. The actual suites are named Stones, Mirrors, Spirals and Scrolls. And, as you would expect, stones = pentacles or coins, mirrors = cups, spirals = wands and scrolls = swords. I also like the mix of cultures: you'll see Celtic style knots as well as East Indian style decoration, among others, and Herne the Hunter is the Emperor but Ma'at is pictured on the Justice card with Papa Legba as Strength and Kali as The Tower. The pictures on this deck also abound with all kinds of wildlife: ravens, bears, dragonflies, dragons, winged horses, etc. I have many, many decks because I love collecting them but I only use a couple for divination. I may consider adding this deck to the ones I actually use, it is such a joy to look upon. Many readers spend their lives collecting decks, enjoying many philosophies while examining and implementing various artistic interpretations. I have my fair share of cards and can admit I have hoped that in this lifetime I would find "The One." This would be a dream deck, of course, wherein it unquestionably represents who I am (not just as a tarot lover, but as a complex and delicate being who walks this good Earth). 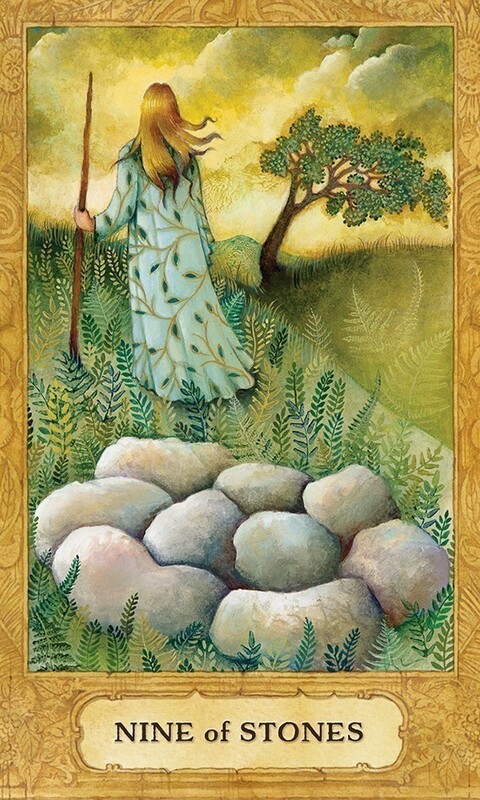 I can say with all goodness and honesty, Chrysalis Tarot is, in fact, "The One." The most glorious part in sharing that information is this deck can very easily be "The One" for EVERYONE. The sacred place from which these players and meanings derive is referred to by the author, Toney Brooks, as "The Otherworld." In this place of dreams you will find majestic and domestic creatures, from dragons and lions to cats and lambs. There are historical figures, both mystical and real. There is Celtic ritual woven and blended with Eastern god and ancient Egyptian goddess energy. 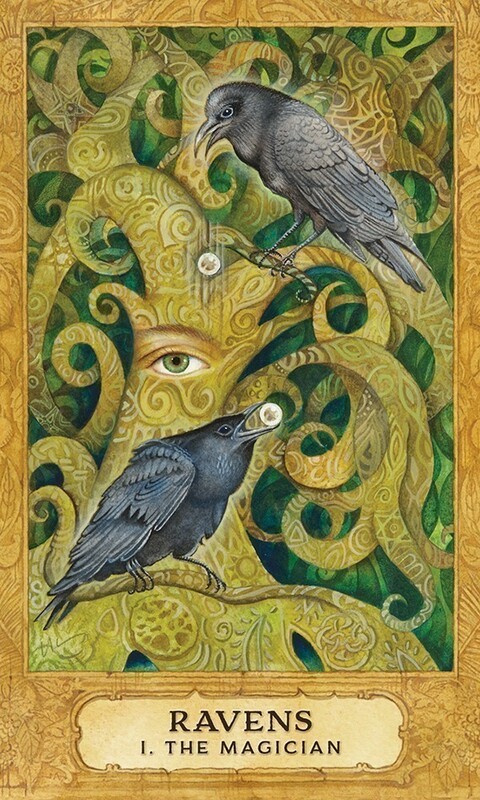 You will seek wisdom from The Crone and The Maiden, A Celtic Owl as The Hanged Man. 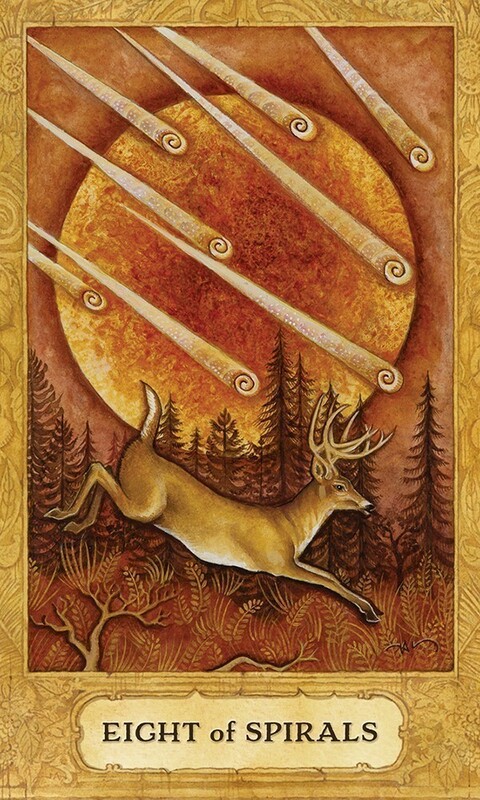 You will feel the innocence of the deer, powerfully running with the spark of creativity in the Eight of Spirals. You will hear the coo of the swans in the Two of Mirrors. This actually brings me to make a point that while the names of suits used in "traditional" tarot have been changed, there should be no trouble at all with understanding and interpreting for yourself or for clients. The guidebook is invaluable and concise. Never have I read a LWB and felt as though I completed a metaphysics course. The information is to the point, yet deeply moving and literary. I particularly loved the introduction of the suits and what they represent before each individual card meaning. My goodness, these cards are beautiful. How many times have we explained to each other, as tarot enthusiasts, "I purchased that particular deck for such-and-such card"? We do this. We buy decks for merely one card, alone. I put myself out there, entirely, by saying every single card in this deck is "that" card. Holly Sierra has channeled heavenly poetic and woozily dreamy love into these images, making her and Toney Brooks a celebrated spiritual force, in my opinion. One of my favorite things about the deck artwork is the different borders around each court card. I LOVE that. It's subtle and clever. And while I go on and on about the beauty of the deck, with its rich colors and soft, summer essence, I can say this is perfect for masculine energy, as well. As for the functionality of the cards, they are shuffled with ease, without bending and/or scraping. They are not too glossy, not flimsy at all. The deck arrived in a small, sturdy box, which I think is still worth saving. I pre-ordered this deck a few months ago and it arrived very quickly and two to three weeks before the actual estimated time of arrival. One last thing I will emphasize about this deck is once I held it in my bare hands I could feel the healing energy radiating through my alignment. This is truly going to help people. I believe this. I am thankful to have found this deck. I am grateful to have found "The One." I know I will use this to the end of my days. 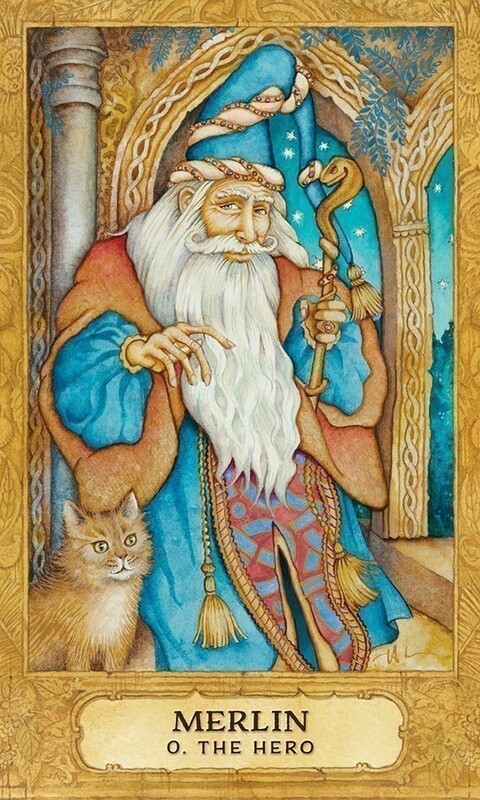 One of the problems with the Tarot in general is that its imagery has become rather stale. Each "tradition" has its own set of pre-cast imagery, and even though some are incredibly beautiful and innovative, still, one is left with the feeling that, "Oh no, another one." When I get a new deck, I am always hoping for something indeed new, but the demand of the marketplace all too often take priority over innovation, and we wind up with a parade of clones. Enter the Chrysalis. Here is the fresh breeze of inspiration that many have been waiting for. The best word I can use to describe the Chrysalis is "Mythic". The images are very fairy-tale like, but rather than calling to mind the standard set of familiar stories, these cards encourage you to generate your own fairy tale, to tell your own story, and become your own myth. While the structure of the deck is similar to the "traditional" tarot, the imagery is very much a new ballgame. They are bright, colorful, and in most cases more suggestive than explicit in meaning. In many cases the images seem familiar, and yet are a very different take on the underlying theme. Consider XV, "The Devil" in a traditional deck, but here, "Bella Rosa," a masked lady parading through a carnival. The mask provides a certain anonymity, an isolation between the world and the inner person. Each one of these cards will make you think about new ways of looking at old meanings. And that is a major breakthrough. A Tarot card has two meanings, an objective and a subjective. The objective meaning, or "denotation", is bound up in a set of keywords, relationships within an esoteric system, and body of knowledge that points to a pre-determined, a priori definition of what the card means. On the other hand, there is the subjective meaning or "connotation", a personal reaction to the card that often draws on unconscious sources that embellish the images with a personal significance. The chief problem in learning to read the Tarot, at least in learning to read it as an oracle, is getting beyond the denotation, into the subjective connotation, which is where the actual divination takes place. In a deck such as this, where the imagery is quite different from the body of traditional, one is forced to rely on the subjective. You will have to look into your own soul to understand what these cards mean, and what they will mean to you is different from what they will mean to anybody else. Subjectivity is individuating -- having to find things out for yourself breaks you off from the herd. And as this deck breaks itself off from the "traditions" -- even, thankfully, the ones I often rely on -- to read it you will need to discover something of yourself that has remained hidden behind the mask. Which brings us to the book. I generally don't like tarot books, but this one is different. Instead of repeating the usual prattle, this one is short, to the point, and serves its purpose of launching your journey, rather than hand-holding you through it. I come from a very different background than the author, and would take issue with much of what is here, but the point is that the issues are raised, and how you follow them through the cards is your own prerogative. The book, in this case, is a helpful tool rather than a hindrance. I could go on about this deck forever, and that is probably the best thing I can say about it. Its mandala-like imagery beckons one to go on forever. For here is a tool for the exploration of the conscious and the unconscious; for as long as consciousness exists, that exploration will go on, and indeed consciousness can only continue to exist where that exploration is possible. I have been waiting on Chrysalis's release for quite some time and once it was in my hands it did NOT disappoint! It was worth the wait! I cannot say enough positive things about this deck. Not only is the artwork gorgeous, the LWB is actually quite detailed for the size and Toney Brooks did a fantastic job with his re-envisioning of the tarot framework. The names assigned to not only the Major Arcana, but the court cards as well (now known as the Chrysalis Troupe) are absolutely spot on. What a breath of fresh air to the realm of tarot this deck is! It's a very accurate deck, and as another reviewer said, very "chatty". I thoroughly enjoy working with it. In fact, I don't even want to put it down. The artwork on the back of the cards is a feast for the eyes in and of itself. Holly really did an indescribably incredible job with this deck.